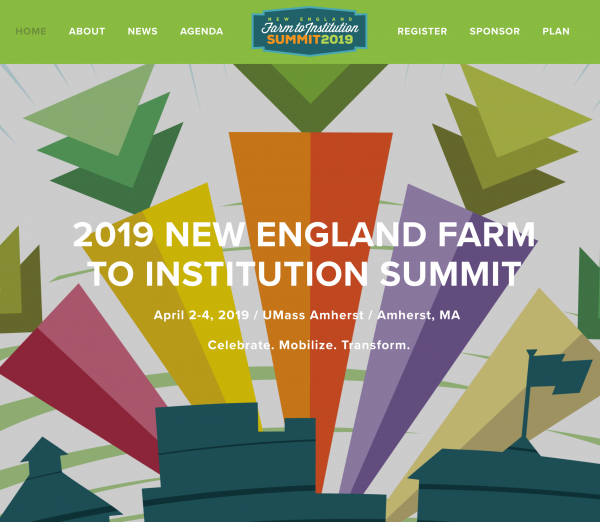 Farm to Institution New England along with our partners Health Care Without Harm, the Northeast Farm to School Collaborative, the New England Farm & Sea to Campus Network, and UMass Amherst are pleased to announce the launch of the website for our third biennial New England Farm to Institution Summit, which will take place on April 2-4, 2019 at the University of Massachusetts Amherst. The summit website, which FINE staff developed in-house, reflects a custom visual identity developed in partnership with graphic designer and illustrator Seth Gregory of Northampton, Massachusetts. We worked closely with Seth to develop a fresh, bright look for the 2019 summit that will inspire people and bring everyone together around a common cause. Currently, the website features baseline information about the 2019 New England Farm to Institution Summit as well as robust details about sponsorship opportunities. From now until April, we'll be adding details about the program, registration, scholarships, field trips, exhibitor opportunities, and more. Check back regularly!